link to the article: "Seeing Spring"
Agoston, who thinks of her photographs as sculpture, emphasizes architecture through form and texture. She reveals depth in her deliberately volumetric photographs by contrasting light with shadow on curved or flat planes. She also stresses what the forms she photographs may evoke in the viewer. Certain subjects, because of their apparent physicality, the way they hang, and the way they intertwine, suggest animal and/or human behaviors like withdrawal, protection, or seduction. Plants growing outdoors – whether in the countryside, parks, or gardens – all move with the breeze and as their buds burgeon, their stems bend, and their petals unfurl. It is the use of digital technology that allows Agoston to overcome such movement and to work until planes of focus match the areas that she has deemed important to expose. Her decision to photograph plants in nature is just as important as it gives her an unlimited choice of subjects and allows her to observe how their elements naturally hang or stand, and how natural light defines form by the way it falls on them. “Untitled”’s photographs are abstract in their departure from reality because Agoston uses black and white, a macro lens, and symmetry and composition to distill chosen aspects of her subjects. Yet the series is hyperrealistic in that images present sharp, high-resolution fragments of seemingly palpable substance. The photographs comprise a romantic spectrum of forms in which feeling is perceptible and the images’ order facilitates smooth movement between and comparison of one to another. Agoston wants a walk through the series to provoke an inner experience that renews the viewer's sensitivity to the natural world. Magnifying small details of plant life that might otherwise go unnoticed brings out their monumental beauty, triggers amazement, and revives from within. By inviting contemplation, her art transcends its subjects. 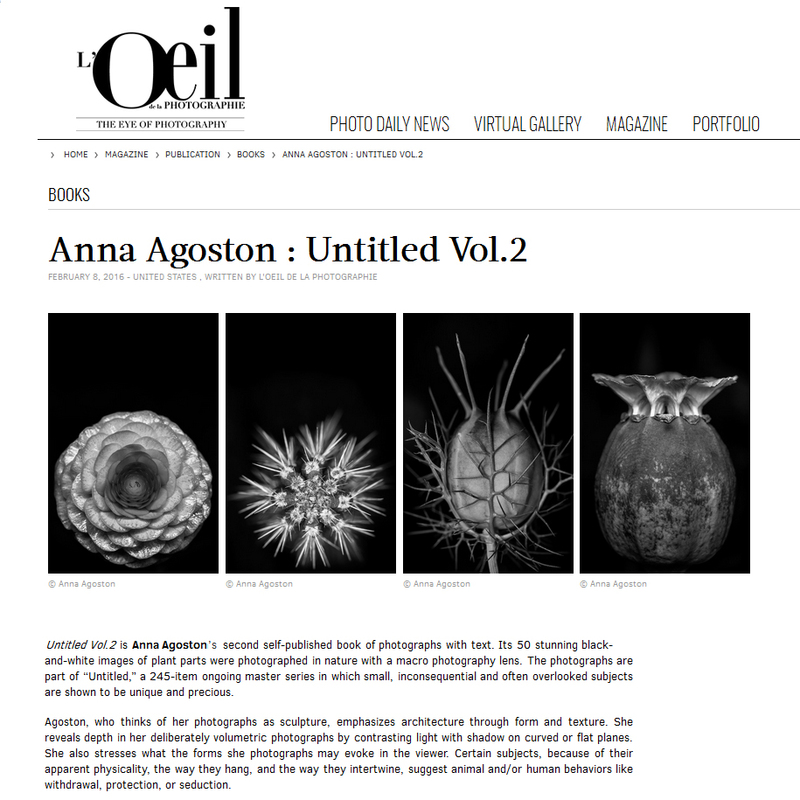 Since its publication in May 2015, Agoston’s Untitled Vol.2 is now in the libraries of the Museum of Modern Art (August), the Smithsonian American Art Museum, the Harvard Art Museums (September), and the Philadelphia Museum of Art (December). It is available through Amazon. My art is of my soul. It is a fabrication of my internal machine, an organic engine powered by my conscious and unconscious minds. It is, however, more visceral than intellectual. I am an artist! I first said those words in October 2013 and since then I have been serious about making art. Saying those words meant I could no longer not make art. Six months earlier I had been laid off from a job that was time-consuming and stressful. My senses were numb and I was oblivious of my surroundings but in the month of March, 2013, when buds, stems and leaves began to sprout, I felt as though I had never seen spring before. I took in the world with my eyes and soul. And I gave in to the urge to make art. When I made the first picture in my Untitled series I knew I had something strong. I couldn't stop looking at it. I contemplated it for days on my computer monitor. It was a picture of a part of a plant stripped of all references to its environment. I loved its simplicity of shape, its complexity of texture, and what these evoked in me. I knew that I had found my way. Looking back now, my path makes sense. I know what structured my internal machine: I grew up in the center of Paris, France, where for months at a time I saw no nature. I lived with my father, a chemical engineer turned German Expressionist painter; my mother, a serious amateur photographer; and my younger brother. Camera, darkroom, and oil paints were all intrinsic to our daily life. We were a modest household in a bourgeois neighborhood. While my brother embraced our artistic heritage at art school, I was more curious about human behavior. Studying psychosis in an undergraduate clinical psychology program gave me insights into how the mind works. I went on to medical school with the idea of becoming a psychiatrist and discovered a fascination with anatomy and with cellular biology's focus on the cell, its form, and its function. After I failed to enter the second year, I took some time off and enrolled in life drawing classes, where I continued to explore human anatomy. I used my portfolio of nudes to apply to architecture school and went on to earn two master's degrees in architecture. Everything came together for me in architecture school. I took classes in anthropology, sociology, and art history as well as architecture. Architecture embraced all my passions: man and art, anatomy and the cell. My maturing internal machine made consciously meaningful but simple statements. In a memorial I designed to commemorate the police killing in 1986 of 22-year-old Franco-Algerian student Malik Oussekine, one entered into a dark downward spiral and emerged into a sky-lit space surrounded by concrete monoliths. My aesthetic sensibility, informed by what I have seen and felt, is intrinsic to my internal machine. One of my first memories is of color combinations on a kimono in a museum where I was taken when I was about six years old... the most beautiful thing that I had ever seen. When I visited Japan in the summer of 2000 I was again moved by what I experienced of the traditional Japanese aesthetic. It spoke to my soul and confirmed what I love. In my Untitled series I see the influence of the traditional Japanese aesthetic whose source is the concept of wabi-sabi. Wabi-sabi originated with Zen Buddhism and was introduced into Japan around the 12th century of the common era. Developing in isolation from the rest of the world, it was to become an internal cultural machine that Japanese people find difficult to explain in Western terms. As Leonard Koren writes in Wabi-Sabi: For Artists, Designers, Poets and Philosophers, "Wabi-sabi is a beauty of things imperfect, impermanent, and incomplete. It is a beauty of things modest and humble." A wabi-sabi artifact suggests a natural process. It is, Koren writes, "irregular, intimate, unpretentious, earthy and simple." I was already in my 20s when I first encountered the sculptures of Constantin Brâncuși at his reconstructed studio in the Georges Pompidou Center. Seeing his use of basic, essential shapes to evoke behaviors like flight and sleep I imagined that his work was less a product of his mind than it was of his internal machine, shaped by his sensory experiences in the land where he had grown up. I think of my Untitled series as being more sculpture than photography. Its emphasis is on each subject's shape and texture, and what they may evoke in the viewer. When my internal machine goes to work, it is the creator while I become one with my subject. I think less than I see and feel. I am entirely in the present, existing only to choose which raw natural elements enter the internal machine to exit as images that will hold my gaze and thoughts. I walk, see, breathe and ideas take shape. I write and ideas shape into words. I see, feel and art is made. What do I do? Why do I do this? What do I do? I go for walks and take pictures of parts of plants. Why do I do this? I love the shapes of plants and what certain shapes evoke. And I love making what I see say what it evokes by making art. "I really believe there are things nobody would see if I didn't photograph them. " I didn't go to art school. I studied psychoanalysis in a clinical psychology undergraduate program; cellular biology, anatomy, and genetics at medical school; and form, space, structure, history of art, and architecture at architecture school. Turning around and looking back, it all makes sense. I don't think of myself as a photographer. I think of myself as an artist, a sculptor. I do use a camera but only as a tool to chisel away at reality. I remove color, background. I define detail. I bring out texture. I arrange, frame. I work until spirit enters the image. I am bilingual. My mother tongue is English. I learned French in nursery school. I have been asked what language I dream in. I cannot answer that question. I believe that we dream in images, that we visualize scenes with actions, people, places, and things. I believe that words enter dreams as images. Images have the power to take us back to the past and forward into the future. They connect us with our inner selves. I do not title my work. I am not interested in pushing viewers to see what I see. I invite them to see through their own, inner selves. What matters is that my images move, transport, invite contemplation. Six years ago today, I woke up to the news that my father, George A Agoston, had passed away peacefully at home, my mother by his side after a long battle. My father was a gentle, sensitive humble man who first and foremost would see and address the good in others. Because of his nature he had many friends, across the world, with whom he would keep in close contact over the years. During the Second World War my father built a chemical engineering research lab at MIT. Refusing to discriminate he took a stand and chose his fellow employees solely on their academic credentials. A few decades ago my father spent months searching for an adoptive country for a Zairian political refugee who was then threatened with expulsion. After a long battle our friend found refuge in Canada. Because of his legal status he was able to grow into a well regarded professor of Mathematics at the University of Montreal. My father was a remarkable artist. My father started painting at age 5. At 9 or so, during the Great Depression, my grandparents asked my father what he wanted to be when he grew up. When my father told them he wanted to be an artist, they took him to visit a starving artist in the Rochester NY suburbs! My father proceeded to work hard, earning a doctorate from MIT in chemical engineering. After a failed first marriage my father took a sabbatical leave from Stanford University -to which he never returned- to travel the world and paint. His career as an artist span more than 30 years. His work, in my opinion, captures the psychological aspect of space and time. As a ‘German Expressionist’ he would portray moments like - a party in amongst artist friends in the Paris of the early 70’s - the first man on the moon - his own version of Manet’s “Dejeuner sur l’Herbe” by using color, and matter (thickness of paint and brush strokes). His work was him, deeply sensitive to environment, people, and times. My father’s ashes were scattered over the sea off the cliffs of the Costa Brava. I grew up in the shadow of the Centre Georges Pompidou, right in the center of Paris, France. For months at a time, I did not get to see or experience nature. An image from a childhood movie remains vivid in my mind. It is a fragment from a scene. There is a snowy landscape. The protagonist dismounts from his horse, bends down, and picks up a twig with two acorns. The twig fills the screen and is gently rotated so that one can take in it's features. We are shaped by the first years of our life. Coincidence has little to do with why we are, who we are, and why we do what we do. In March 2013 I was laid off from a stressful and time-consuming job. Buds, stems and leafs were sprouting. It was as though I had never seen spring before. I needed to somehow contain this budding excitement in my art. I also had to get lines straight up and down. My mother was an amateur photographer. I remember her instructions when I was a little girl. The framing of the image was important. I also had to get lines straight up and down. I tried various media, such as oil on canvas, before settling on photography. Photography satisfies me and enables me to say what I have to say without thinking too much about it. I have a visceral connection with the camera. The camera is an extension of my body that enables me to make what I have in my mind. There are childhood memories that never leave one's side... that, in fact, throughout life take on meaning. Decades ago, I had a play date at a friend’s home; I remember a large wall meticulously covered with dozens, possibly a hundred, of versions of the same line drawing... the same line drawing except that each was very slightly different from the one that came before it. Today I find solace in the act of doing and redoing; in repetition there is growth and the knowledge that I am that much closer than I was... As Georgia O'Keeffe said, "I believe that if I paint this mountain enough, God will give it to me."